A gear hauler on wheels is the best way to describe the OMS Cargo Roller. With it's heavy duty wheel set and telescopic handle will haul it all. Made with ballistic nylon, reinforced 2 inch webbing and heavy duty quick release buckles, this bag will take all of your gear anywhere your dive mission leads you. Have to climb 2 flights of stairs? No problem, the OMS Cargo Roller has convertible shoulder straps neatly stowed away and can easily be deployed on a moments notice. 'Wasted you no free weight at your next dive travel: this giant role backpack weighs less than 26 g per litre volume and length to your natural hair. It is ideal for your next travel. 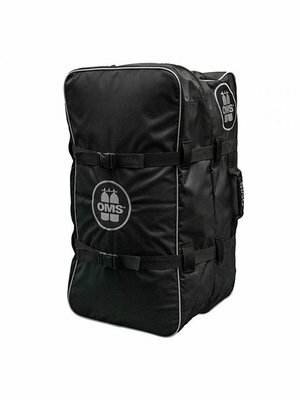 Well-loved by many diving "use" Large Parts Of Your Pockets Free Luggage for the bag and will no longer have enough "free weight for your diving equipment.The large OMS roller Rucksack has approx. 145 litres Volume and weights 3700 g. Is still it sturdy design and is also take full comfortable for flying or diving to space. 2 large, ball bearing mounted wheels and retractable telescopic handle make it your perfect travel companion.Using the padded shoulder straps it can be worn in an emergency Can also be. And if you want to he did not full, it can be wiped clean with the help of the lashing straps reduces and your baggage does not slip unkontrolliert back and forth.